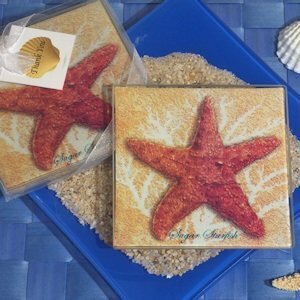 This starfish glass coaster set is an ideal favor for any beach themed event! The useful set will be a welcomed gift your guests will bring home and enjoy. 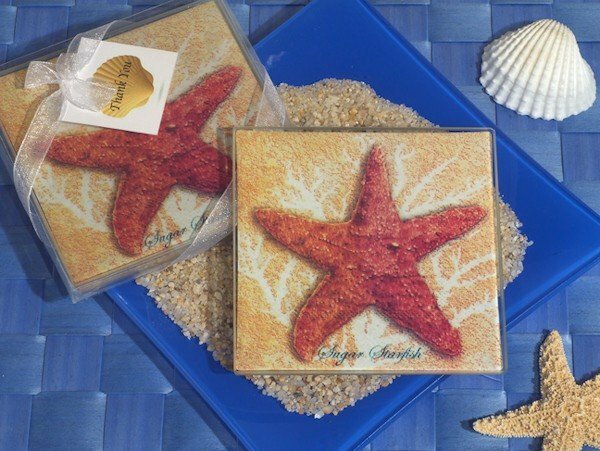 They feature a starfish on a sandy background decorated decal on each glass coaster along with the words "Sugar Starfish" along the bottom of the coaster. Measuring 3.5" square, they are sold in sets of 2 and arrive a clear gift box with a white organza ribbon and a matching "Thank You" tag.